1888 - 1915 2 pcs shares, 1x Serbia on 10 golden dinar from year 1888, Austrian revenue 7Kr + Austrian share for 100 Koruna Kriegsanleihe from y 1915, halving Czechosl. revenue. Only folds. 1889 Austria 100 guldenová share Premien - Schuldverschreibung, mounted 4 Czechosl. revenues, fold. 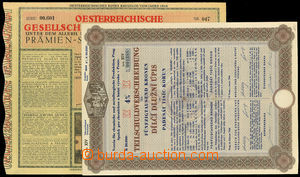 1916 - 44 Austrian ticket Gesallschaft vom Red Cross on/for 20 K + Bohemian and Moravian debenture bond for 50000K Club/Association for chemical and metallurgical production in Prague, format A4. Superb. 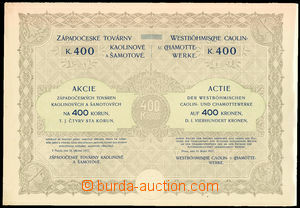 1917 Shares on/for 400 K Západočeských factories kaolinových and šamotových, format A3, light fold. 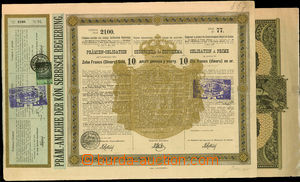 1922 Shares - bond on/for 1000Ł Main town Prague with imprinted stamp on/for 20 Pounds, format A3, folded. 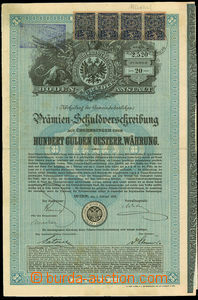 1922 debenture bond for 100Ł Czechoslovak state loan from y 1922, with 2 revenue postmarks, format A3, folds. 1922 debenture bond for 100Ł Czechoslovak state loan from y 1922, with 3 revenue postmarks, format A3, folds. 1925 - 40 Germany 2 pcs shares, from y 1925 Anleiheablösungsschuld CDS on/for 50RM (light fold) format A4 + share for 1000RM from y 1940 Schatzanweisung des CDS, superb. 1936 Czechoslovakia obligation State umořitelné loan defence state on/for 5000 CZK. overprint Protectorate. Author printings Stanislav Ulman. Perfect. 1936 Czechoslovakia obligation State unifikační loan on/for 1000 CZK with overprint Protectorate. Author Cyril Bouda. good condition. 1939 - 41 Sudetenland 2 pcs of debenture bonds, 1x on/for 1000RM Kommunal-Anleihe Reichenberg, 1x Sudetes. Volksfürsorge, format A4, fold. 1941 - 42 Sudetenland 2 pcs of debenture bonds, 1x on/for 200RM Komunal-Anleihe Reichenberg, 1x on/for 1000RM Treibstoffwerke Brüx, format A4. Superb. 1944 BOHEMIA-MORAVIA 2 pcs of debenture bonds North railway Ferdinand's Prague on/for 5000K and 10.000K, format A4, superb. 1944 BOHEMIA-MORAVIA 2 pcs of debenture bonds Club/Association for chem. and metallurgical production on/for 5000K + 10.000K, superb, format A4.